Each year, the Department of Computer Science faculty identify several computer scientists who are recognized as leaders in the field and whose ideas and research command the attention of the students and faculty. A select group of individuals are then invited to be a part of the annual Samuel D. Conte Distinguished Lecture Series on Computer Science. 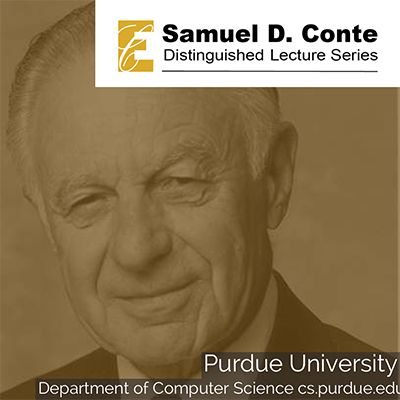 Samuel D. Conte (1917 - 2002) founded the Department of Computer Science at Purdue University in 1962. His vision and active involvement nationally and internationally played a vital role in defining the discipline of computer science worldwide. In 1993, the Samuel D. Conte Endowment was established to honor Dr. Conte and his devotion to excellence in teaching and research in computer science. 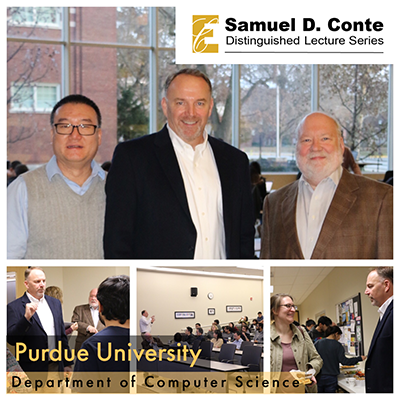 The Samuel D. Conte Lecture Series, sponsored by the endowment, serves as a permanent testimonial of his contributions to the Department of Computer Science, to Purdue University, and to the computing field. Abstract: Advances in machine learning have enabled to new applications and services to process inputs in previously unthinkably complex environments. Autonomous cars, data analytics, adaptive communication and self-aware software systems are now revolutionizing markets and blurring the lines between computer systems and real intelligence. In this talk, I consider evolving use of machine learning in security-sensitive contexts and explore why many systems are vulnerable to nonobvious and potentially dangerous manipulation. Here, we examine sensitivity in any application whose misuse might lead to harm-for instance, forcing adaptive network in an unstable state, crashing an autonomous vehicle or bypassing an adult content filter. I explore the use of machine learning in this area particularly in light of recent discoveries in the creation of adversarial samples and defenses against them, and posit on future attacks on machine learning. The talk is concluded with a discussion of the unavoidable vulnerabilities of systems built on probabilistic machine learning, and outline areas for offensive and defensive research in the future. Advances in machine learning have enabled new applications and services to process inputs in previously unthinkably complex environments. Autonomous cars, data analytics, adaptive communication and self-aware software systems are now revolutionizing markets and blurring the lines between computer systems and real intelligence. This talk considered the evolving use of machine learning in security-sensitive contexts and explored why many systems are vulnerable to nonobvious and potentially dangerous manipulation. There is sensitivity where misuse of an application could lead to harm—for instance, forcing adaptive network in an unstable state, crashing an autonomous vehicle or bypassing an adult content filter. The use of machine learning was explored in light of recent discoveries in the creation of adversarial samples and defenses against them, and posit on future attacks on machine learning. The talk concluded with a discussion of the unavoidable vulnerabilities of systems built on probabilistic machine learning, and outline areas for offensive and defensive research in the future. Dr. Patrick McDaniel is the William L. Weiss Professor of Information and Communications Technology and Director of the Institute for Networking and Security Research in the School of Electrical Engineering and Computer Science at the Pennsylvania State University. Professor McDaniel is also a Fellow of the IEEE and ACM and serves as the program manager and lead scientist for the Army Research Laboratory's Cyber-Security Collaborative Research Alliance. Patrick's research centrally focuses on a wide range of topics in computer and network security and technical public policy. Prior to joining Penn State in 2004, he was a senior research staff member at AT&T Labs-Research. Follow Purdue Computer Science on Twitter, Facebook & Instagram.